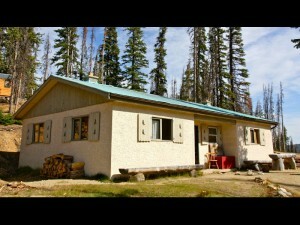 Located behind the lodge, the bungalow has four guest rooms and two washrooms with showers. Each room has two twins beds or one king bed, a vanity (sink with hot/cold water) and a wood-burning stove heater. The Bungalow has a rustic touch but is very cozy and is the perfect accommodation for groups of 8 guests.